Back in my days of college and grad school, a bike was a necessity to get around. 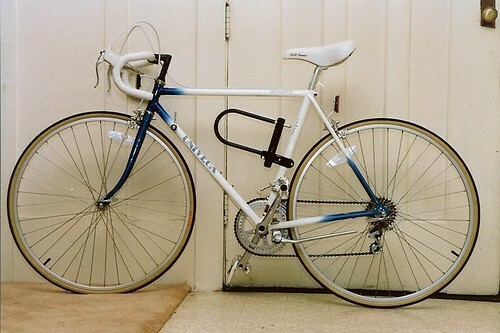 In 1987, I bought a new bike in California for grad school. It was my prized possession. 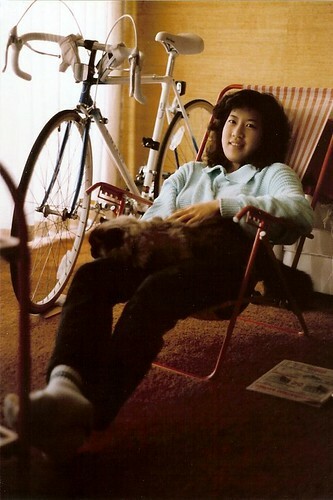 Here's a bonus shot of me and my bike in 1989. But the 5.4 miles from my apartment in Oakland to the UC Berkeley campus was a killer on a bike. There was a hill on Linda Ave, where I always felt like I was going to die. Sometimes I hopped off and walked to the top. Going to school was a gradual uphill for 3 miles (thanks to Google, I determined this was about 300 ft). I would arrive in class with my hands shaking so badly, I couldn’t take notes. On rainy days, I would take the bus and eventually I bought a moped to zip to school. 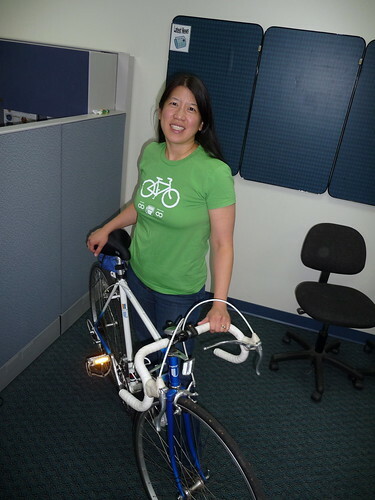 In 1993, I had a job in Cambridge, MA which was bikeable from my home in Winchester, MA. But this commute was through heavy city traffic, and there was hill at Teele Square which was a tough. Every time I went up it, I would be on the verge of hopping off and walking. I thought it would get better as I rode more and got in better shape, but it never did. I hate hills! The 7.9 mile ride took about 35 minutes, which was nearly the same time as by car with all the traffic. For 10 years after that, my commute was 34 miles, which was definitely not a biking distance for me. When I started my current job in 2005, I had a dream commute of 9 miles, but also kids to pick up from daycare before and after work. 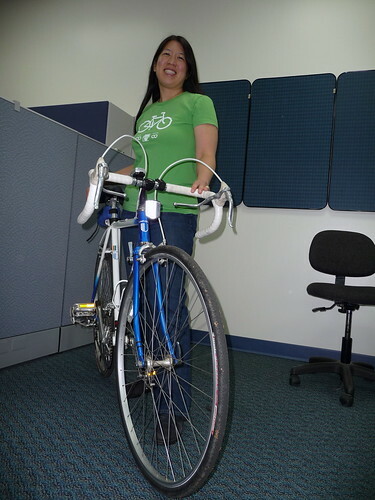 So I brought my bike into work and rode around 12 miles at lunch on a nice flat bike trail near work. No hills, no traffic, good temperatures, good tunes and podcasts on my iPod, it was cycling heaven for me. But I always had that nagging feeling that it wasn’t very green to be driving to work and riding my bike just for exercise and not for transportation. Sure, I wasn’t driving to the gym and using gas, but it still bugged me. In reality, I was afraid of this hill that I couldn’t find a decent detour around. This is a major road with a pretty narrow shoulder, lots of traffic and cars going around 40-50 mph. I wasn’t sure I could even make it up the hill, let alone negotiate the cars and the shoulder. I’m 43 now and not in my 20’s anymore! This section of road was also riddled with potholes which made it even more dangerous. They paved it a few weeks ago, and I finally took the plunge and rode to work last week. Miraculously, the hill wasn’t too bad. I didn’t even have to get into a standing position. It was over before I knew it. Once off the main road, it was smooth sailing to the bike trail and to work. I made the 10.7 miles in 44 minutes, at an average speed 14.4 mph. I couldn’t believe I made it! I was a little concerned about the ride home since the ride in was so easy. It was definitely harder. The hill on the way back was tougher and occurred 35 minutes into the ride. But I made it without feeling like I was about to die. In fact, the second time I rode back from work, I did it in 45 minutes, nearly the same time as the easier ride in. Could be that I’m actually in better shape than before? At least now I can proudly wear my Infinity MPG shirt for finally commuting to work on my bike. By the fall, I will definitely be in awesome shape! Yes, this is the very same bike from 1987. It’s held up so well for me, why get a new one (yet another green move)? OK, it’s ancient, but at least it has index shifting. I admire your courageous spririts. 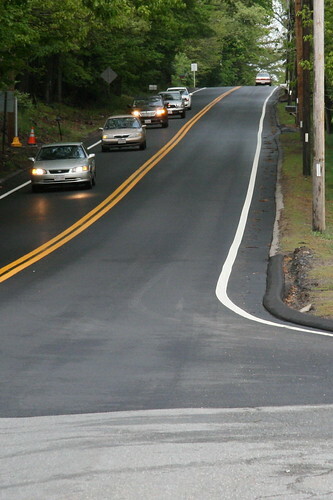 Roads in Pepperell are narrow, not made for biking. Please have a second thought if it is safe to ride bike for working.